Normally, we identify our squeezes by an index that was written up by Professor Nigel Kennell in the ’70s or by the handwritten notes by Professor McGregor that has the IG (Inscriptiones Graecae) number or the EM (Epigraphic Museum) number somewhere on the squeeze. With the delicate state of some of our squeezes, we are very grateful for these references. When Lisa couldn’t identify this stunning squeeze, though, she decided to try to take it to social media. She sent out a tweet on Friday afternoon calling all Greek epigraphists to help identify the squeeze which was quickly retweeted around the small but active epigraphic community. We are also deeply amused by how much simpler this process was than the debates that took place in the 1930s. 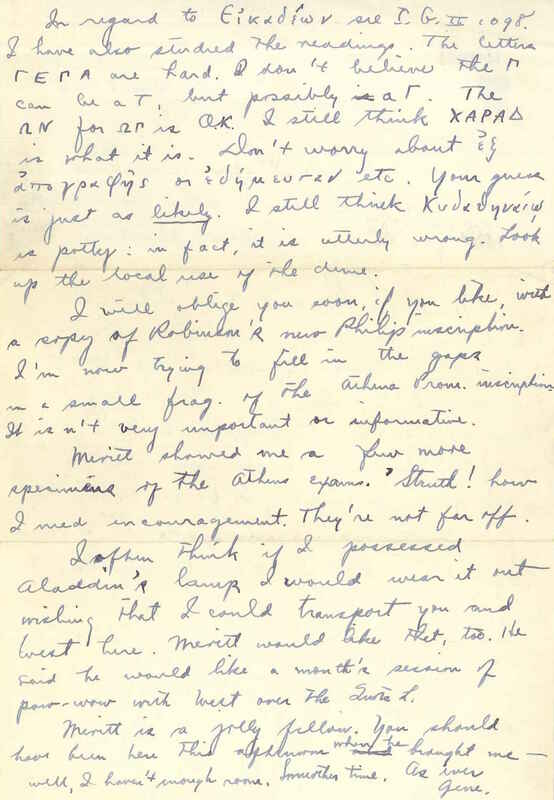 One of our favourite parts of our squeeze collection is actually a letter between ‘Mac’ (Malcolm McGregor) and ‘Gene’ (Eugene Schweigert) from 1935 arguing over certain transliterations from a fragment of the Athenian Tribute Lists. Considering Mac was at the University of Cincinnati and Gene was at Johns Hopkins, the debates must have taken quite a while to come to a resolution. With how difficult squeezes are to read, it’s understandable that there was a lot to discuss. Plus, if you’ve read our previous posts about the process of digitizing squeezes, you know that one advantage to our new images of them is that epigraphists no longer needs to be able to read Greek backwards. Don’t forget, too, that epigraphic Greek was written in all capitals with no spaces or punctuation, it’s no surprise that sometimes the arguments came down to a single letter. Which was backwards. Today’s accessibility to images enables us to quickly compare images instead of relying on other people’s squeezes and readings of the inscriptions. This letter was written four years before the first volume on the Athenian Tribute List was published by McGregor, Merritt and Wade-Gery. 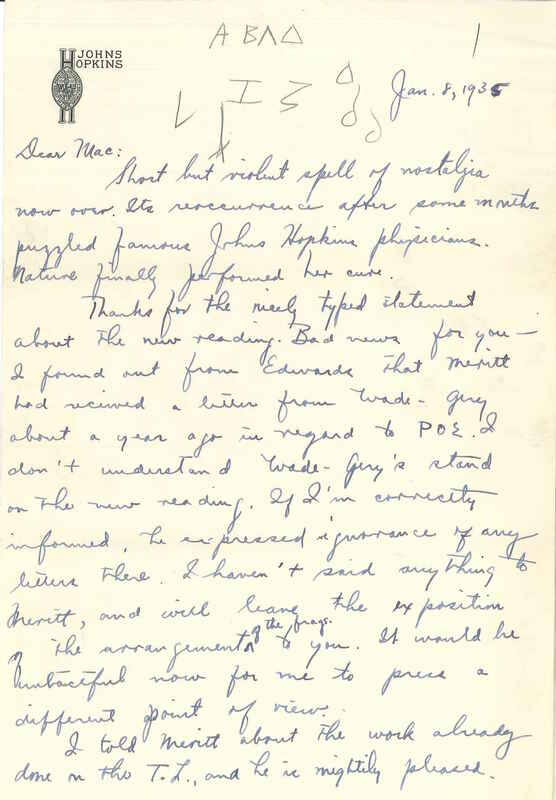 Both men are mentioned in the letter and at the end Gene says that he wishes he could spend more time with Mac and West. Allen Brown West, though, died in a car accident in 1936 and the first volume was dedicated to his memory. The forward in the volume makes it quite clear that his work was invaluable to their research and that his friends missed him very much. Reading the letter, it’s not hard to see the similarities between these men who were at the beginning of their academic career 80 years ago and those of use who are working on this project today. It’s comforting, and entertaining, to see that they had to adapt to having long distance friends (which anyone in academia can tell you is an occupational hazard). In our department, working on a project at this magnitude is only possible because we rely on each as friends as well as colleagues, and it was nowhere near the scale as the ATLs. Who knows? It could always keep growing.